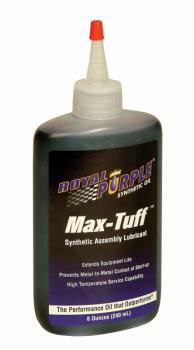 Max-Tuff is an ultra-tough, synthetic lubricant. It’s designed for engine builds and repairs, specifically crankshaft, camshaft and rod bearing assembly. Max-Tuff utilizes unique, synthetic molecules that adhere to metal surfaces to create a formidable, load-bearing physical barrier between surfaces. This minimizes the metal-to-metal contact and wear in boundary lubrication conditions, and provides excellent protection against rust and corrosion of both ferrous and nonferrous metals.